“When the going gets tough, the tough get going”; whilst this is often merely a clichéd, pretentious antimetabole that is used to ill-effect to motivate people of larger and softer proportions to stay on the treadmill for a few minutes longer, it is also what I wrote down in my journal during my last trip, when it seemed that the entire universe was conspiring against me to thwart one of my most sought after dreams, to drop a 100ft waterfall in my kayak. When people ask me why I would want to do this sort of thing, they are often left disappointed by my explanation. They expect heroic reasonings of how I am “pushing my sport”, or tales of a quest to “break new ground”. Unfortunately, my answer can’t live up to their questions expectations, and my reply is simply, “Because I want to…”, which I think is actually the best reason to do anything. There are, however, some people that not only accept that answer, but understand it. 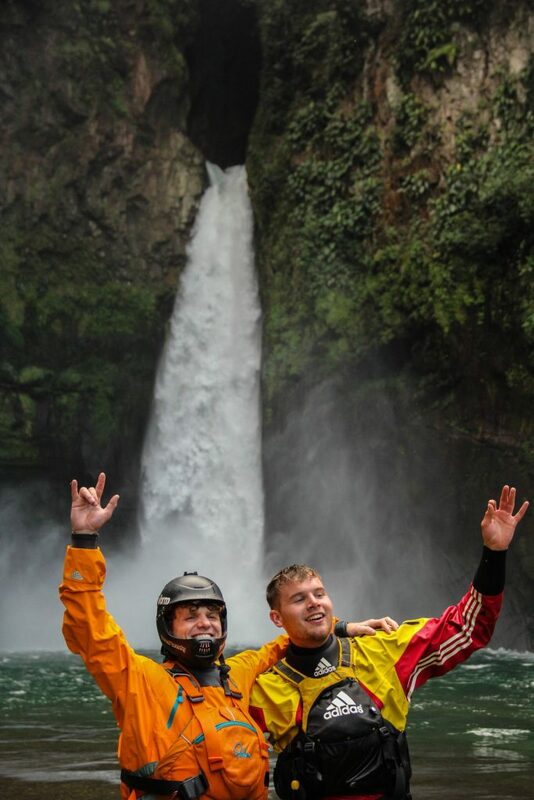 When I told my most frequent partner in crime, Adrian Mattern of my desire to run the 128ft Big Banana falls in Mexico, he smiled and admitted to having the same goal and so once again, we teamed up to take on another piece of challenging whitewater. When we first made that decision, we knew there would be some challenges, but we were blissfully unaware of just how badly things would step out of our favour; flight prices were absolutely astronomical, and both of our bank accounts almost hit zero in order to pay for the tickets. We were both left horribly sick after a kayaking trip in Pakistan, so much so that it was a struggle to hold ourselves together long enough to board the plane to Mexico. The TSA glanced suspiciously as we sweated profusely going through airport security, and Adrian almost fainted a few times before we made it to our seats. When we landed, Adrian had his camera stolen within minutes of being in the country, and far worse, we found the levels to be low and the waterfall out of its prime condition, much like ourselves. 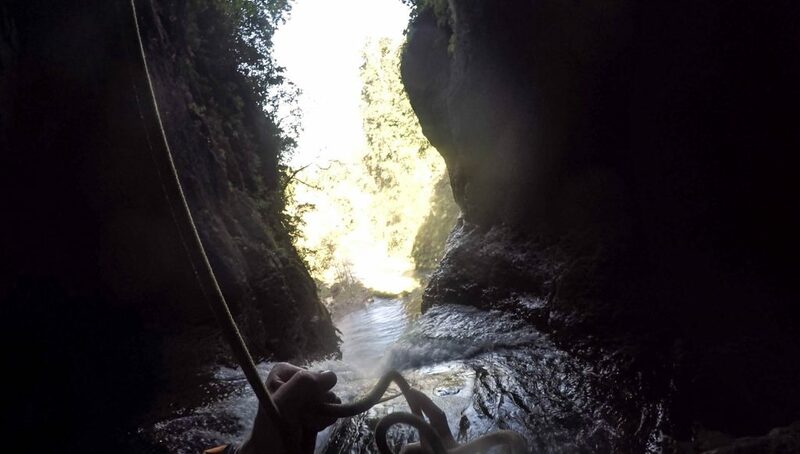 One of the few people that knew how to access the top of the waterfall was repeatedly too busy to take us to scout the lip, and on top of all this, the only way to run Big Banana is to rappel into the gorge above with a climbing rope. Neither myself nor Adrian knew anything about ropes or climbing, and I am also relatively petrified of heights when I am not in my kayak. In short, it just didn’t seem like things were going to work out. History is filled with an extraordinary amount of exceedingly brave people that didn’t listen to the warning signs and suffered the consequences. As I lay in my bed one night on the first week of the trip, I couldn’t help but feel like something was trying to stop us from running this waterfall. I thought long and hard about the risk involved, crashing off a waterfall of this height could at the very least seriously injure you, and at worst drastically alter the course or length of your life. Eventually I came to the conclusion that it was merely a series of unfortunate set backs, and that perhaps it was a test or an opportunity to reflect on why I actually wanted to do this. 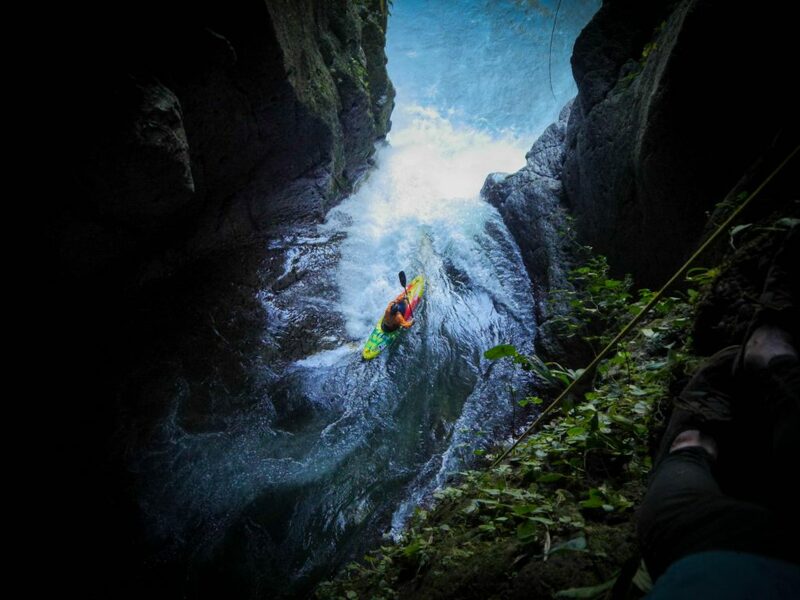 The following morning I frantically Google mapped a way to the lip of the falls, and bought the help of a talented 18 year old climber and kayaker named Walker with the promise of future beers. In order to see the lip and to check whether the waterfall was actually run-able at these flows, we had to rappel down. Walker kindly provided us with yet another set back by forgetting the climbing harnesses at the hostel that morning, however he quickly fixed the problem by making a new harness out of two pieces of webbing and a carabiner; I looked at him apprehensively as I eyed up this motley assortment of webbing and metal, and he finished setting up the rope system and told me it was good to go. I looked at him apprehensively once again. Would this actually work? Am I about to fall 70ft onto rocks and then be swept over the falls? How bad do you want this? I eased myself over the edge and found to my great delight that the rope and harness held and that I wasn’t about to plummet to my death. The descent, whilst being initially scary at first, was actually the easy part, the hard part was getting back up. I am led to believe that if you have the right climbing device, getting back up a rope is not too much of a difficulty. Unfortunately, we didn’t have one of these magical devices. Walker had instead rigged up an ascension system with two webbing prusiks. I unsurprisingly couldn’t get the system to work, which left me in quite a predicament as I dangled freely over the waterfall, 70ft below the spot that I needed to return to; it is fair to say that I have not been this scared and clueless since my first time alone with a girl… Eventually I elected that my only way out was to climb the rope, like in school. When I made it back to the top, I warned Adrian that he may have to Tarzan his way out of there, but said nothing upon my thoughts on whether or not I thought the waterfall was possible. In the interest of not letting each other’s excitement get the better of us and make us do something we would regret, we had made a pact to keep our decision quiet until each of us had looked at the falls. When Adrian came up, he was firmly on the fence as to whether he would run it or not, which put a lot of questions in my head; normally we are pretty much the exact same in terms of what we think is possible in a kayak. Did I want this too much? Was I about to make a bad decision? I had firmly decided when I was on the end of the rope and looking at the lip that, whilst not ideal, it was completely do-able and I could hit the line. I began making plans with Walker to run it the following day and rallying some friends to come and help with safety and filming. Adrian stared at the photo he had taken of the lip most of the night and eventually came to the same conclusion; far from ideal, but do-able. I got sick later that night and barely slept a wink, I threw up repeatedly in the morning and couldn’t eat any breakfast. Surely this was not a final warning sign? 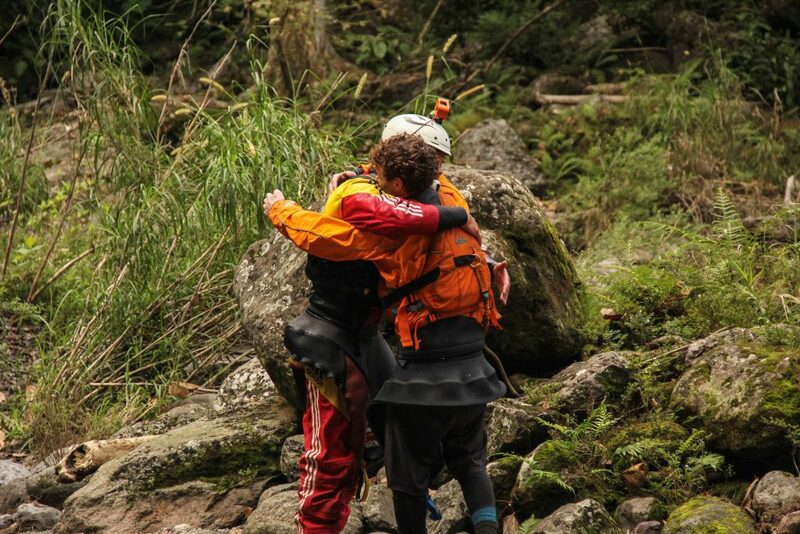 It took us a while to set up the rope system to descend down, and I was relieved when I was finally able to say my goodbyes to the boys up top, wish Adrian good luck and start the journey down. All was going quite smoothly with the descent and I was beginning to feel quite confident with rappelling when all of a sudden – Whoosh. The end of the rope whipped past me and fell into the river, I watched it all happen in horrifying slow motion as the rope was pulled tight by the current and began dragging me towards the falls. I didn’t have a prusik on the end of my belay device, which meant that if I let go of the rope I would fall all the way down into the water and be swept over the falls. I wrapped the rope around my hand (This is a big “No-No” in the world of climbing) and jammed it into the end of the belay device. I then began hauling in the end of the rope with my left hand and my teeth. Eventually, with much effort and several swear words, I was able to retrieve the end of the rope and pendulum over to the ledge. Safety at last, well, relatively… there was still the matter of a 128ft waterfall to contend with. I signalled to the team that I was okay and to send my kayak down. 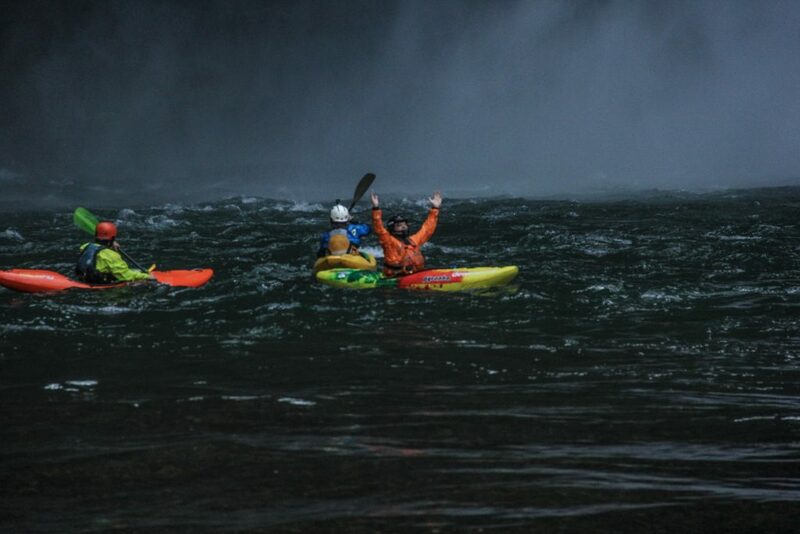 When my kayak reached me, I wasted no time and started to get ready. I put in at a spot that, whilst being fairly secure, was also precariously close to the lip and I had to do a small attainment/ferry glide move to get into a good spot in the pool above the waterfall to warm up and take a minute to get in a good head-space. I paddled around in the top pool, warmed up my shoulders and core, and then tried to find that magical feeling I get before all of my best lines; calm, excited, and clear-minded. The impact was absolutely colossal… I don’t think I have been hit that hard since I was first caught swearing in front of my mum. As I was underwater, I realised that I was severely winded but unhurt, and my paddle had been torn out of my hands on impact; I snapped a hand roll up and tried to take a few breaths as I celebrated. I never normally claim anything because I think it’s hugely uncool, but I was just so stoked to be at the bottom that I couldn’t help it; I also wanted to let everyone know that I was okay. Thankfully, I think they got the message as my arms stayed above my head for several minutes after I had landed. As stoked as I was, I couldn’t be fully relieved or happy until Adrian was at the bottom and celebrating with me. 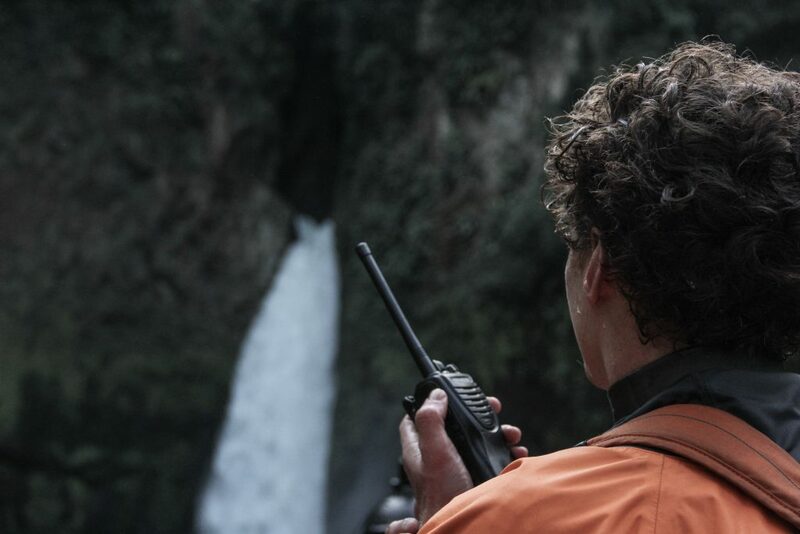 I relayed to the team via my radio that Adrian should take better care not to drop the rope in the water on his way down. I spent the next 30 minutes hoping that Adrian would be efficient as always and stomp the line like I knew he could. 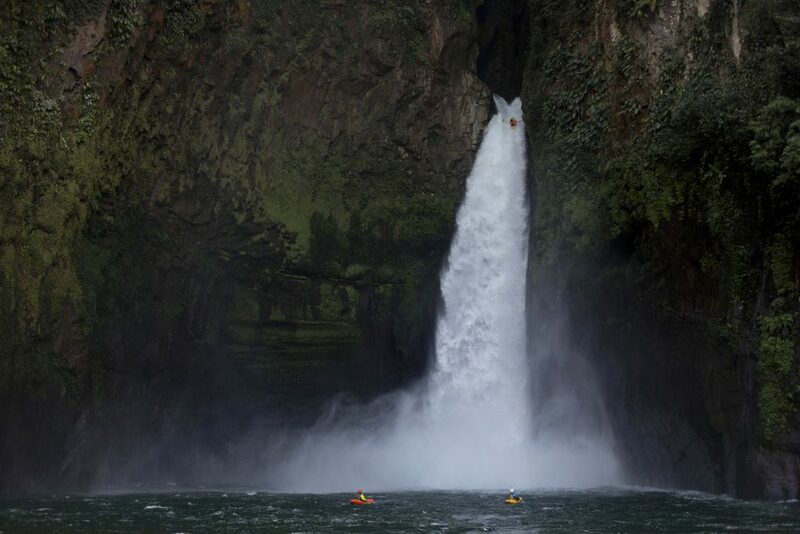 The call came over the radio that Adrian was about to drop, and I watched, awe struck at how small he was and how big the falls were as he appeared at the lip and started his ride down. For a very brief second I saw his kayak wobble and his nose come up, and thought that he was going to eat it and that we would be taking a trip to the hospital. Thankfully, he corrected himself and rode it down like a boss. Adrian also took a tremendous hit at the bottom, but was otherwise fine. With my best mate at the bottom safe and sound, it was finally time to relax and enjoy the feeling of what had just taken place. If you’re into facts and figures, then this is the second biggest waterfall that has ever been successfully descended, and is a new British record by around 50ft. Upon reflection, this project should never have worked. Everything was stacking up against us and I think many people would have called it quits a long time ago. We muscled through everything though, and somehow made it work. Ultimately, it reaffirms my beliefs that all adversity really is, is a test to see how badly you really want something. If there is anything to take away from this mission, it should surely be that if a small ginger bloke from Warrington, with a distinct fear of heights and no climbing knowledge, can rappel into a remote gorge and drop 128ft down a waterfall in a kayak, then you, my dear reader, should be capable of absolutely anything you put your mind to. Wishing you all the best of luck with your goals for 2018, and a very happy New Year! *I do not recommend ever attempting to do any of the sketchy things that I had to do to make this descent happen. Please be smarter and more responsible than I was. *For everyone that is rightly horrified by my climbing antics, and is considering flocking to the internet to criticise, please note that I accept it was dumb and I fully intend to work on my climbing and rope skills much harder in the coming year.